The panel included who had completed successful finance internships in various industries. They provided advice on best practices for the process of getting an internship and what they learned as interns. start building your network now. It takes time to buildup relationships so that people in the network will vouch for you. When they vouch for you, they are putting their own reputations on the line, and they do not want to be embarrassed. network with alumni because some will mentor you—they will give you advice and knowledge. Some go so far as to prepare you for the interviews, perform mock interviews and give you their industry contacts and knowledge. you never know who will be a valuable contact so even nontraditional contacts can be good (one student started a relationship with a person they met at a fund raiser for the zoo, and the contact led to a job. some organizations that have internship programs do not come to Purdue so you have to seek them out. finance is so diverse that it is hard to know what you want to do. Having internships in several areas helps you decide what you want to do and more importantly, what you don’t want to do. being invited to a recruiting dinner is important. You are being sized up—they are determining whether they would like to work with you. no university can prepare you with all you need to know for the job. what matter is how you think. The critical thinking we learn at Purdue (breaking things down into components which you then address) is an important skill. Women with internships and careers in finance discussed career development and growth. you have to recognize the implications of how people will view you because of the choices you make. Some will be satisfied with your choices while others will not. the job market was not good so I took one with a Russian bank and that gave me a route to J.P.Morgan. The Russian experience gave me an second language, an appreciation for other cultures and how business is done elsewhere. This gave me an ability to navigate uncertainty. as men start working with women, they can be unsure of how to deal with issues they have not faced before. Senior managers will come to me and ask how they should deal with these issues. You have to fit in. At the company I work at, there are a lot of “bros.” As a result I have learned a lot about sports. women need to be aware of an underlying assumption that is still around—that family matters will interfere with their work. A father who stays home with a sick child is considered a hero dad while a woman who stays home is missing from work. I assume that the time of those reporting to me is unlimited unless they tell me otherwise. If they have other priorities, they need to tell me. people recognize that we each have “special times”. my team knows the ebb and flow of the work load. At times everyone has to be committed to the job. take vacations. You come back refreshed and are more productive. at times you need to rebalance the load between work and the rest of life. that I show grace when I screw up. I own the mistake and that I fix it. dressing as a women helps remind the men that you work with that there is a woman present. Then they are more likely to behave themselves. what you wear can be part of your brand. When you wear bright clothes, you stand out. People remember you. 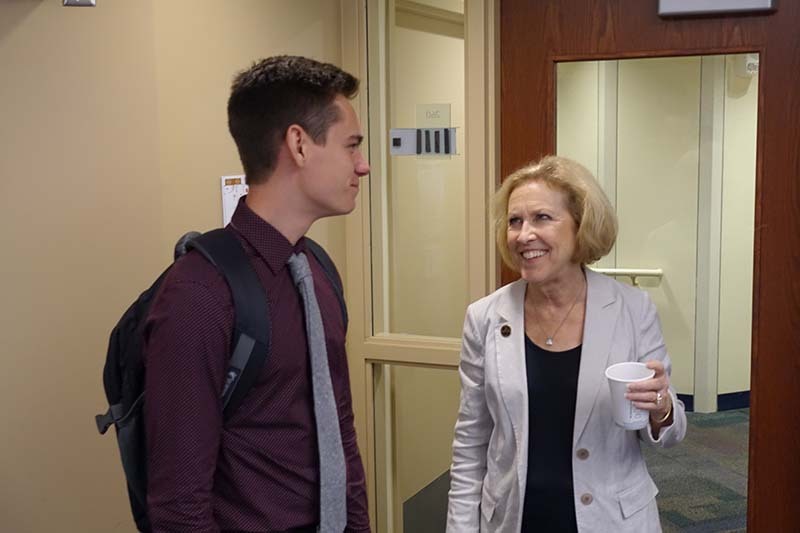 Distinguished Purdue alumni shared their career paths, experiences and thoughts about financial roles in industry. can the reputation of private equity continue given so much money around chasing deals? The prices at which companies are being bought and sold is incredible. How much longer will this continue? It’s a great time to be on the sell side of deals. Are company valuation true or inflated? is the market going to turn down? The funds are quickly scaling up, attracting more money. They will have to live through any downturn. The gap between good and poor investment banks will grow. the imposition of tariffs will affect products and supply chains. At present the products on which and the levels at which they will be applied is uncertain at this time. the pharmaceutical industry is very pipeline driven with global supply chains. Economic disruptions are an issue. rising interest rates are a good thing in my business but refinancing at higher rates becomes a problem for companies. Where is the break point at which the companies are carrying too much debt? having national debt is not necessarily bad but how much can we take on and still manage it? did they appear to be curious given the questions they asked. This shows that they care about the business. Anyone can read reports and give numbers. Did they want to go deeper? we want to hire great people so we ask them to tell us who they are, what motivates them, how they define success, how they handle failure. We also judge whether they are inquisitive and whether they can be trusted. facts about the interviewee (GPA, courses) are table stakes. Hiring decisions are not made on these. So make yourself an interesting person, someone the interviewer will remember. One panelist had been a field scout, collecting bugs in farmers’ fields for the summer. The interviewers identified her as the “bug” person. fifty percent of any job is communication as everyone works on teams these days. So we want to know whether you fit our culture and get along with others. when the interviewer is doing a day of interviews, get in the first interview. Then the interviewer is fresh. when you work with other areas (analysts for example), bond with them. You need to know the people you interact with. Your future is dependent on them. show that you can learn rather than being intimidated by your level of knowledge. take time to reflect on what you are learning and how it all fits together. The problem we have is that we never reflect; we are so busy doing things to get them done. do not be afraid of asking the CEO to go to coffee with you. The worst they can say is no. And their having a relationship with you can be beneficial for them. You come with a different set of skills and perspective. “bloom where you are planted”. Take advantage of the opportunities you find yourself dealing with! understand the contribution that your role makes to the team effort. Then make yourself accountable for making that contribution. be flexible because situations will be different over time and with different teams. When you get into new situations, some trial and effort is required to make things work. be open to opportunities when they are presented. Some come when you least expect them. take advantage of where you are now. There is always something to learn. we do business globally so it is essential that we have diverse staff. Markets vary in many ways: cultures, prices, products. You do not understand these differences without a diverse staff. sometimes colleagues will disagree on what the assumption should be. You have to know when you are on firm ground with your assumptions. You know what is right based on your technical knowledge or for ethical reasons. 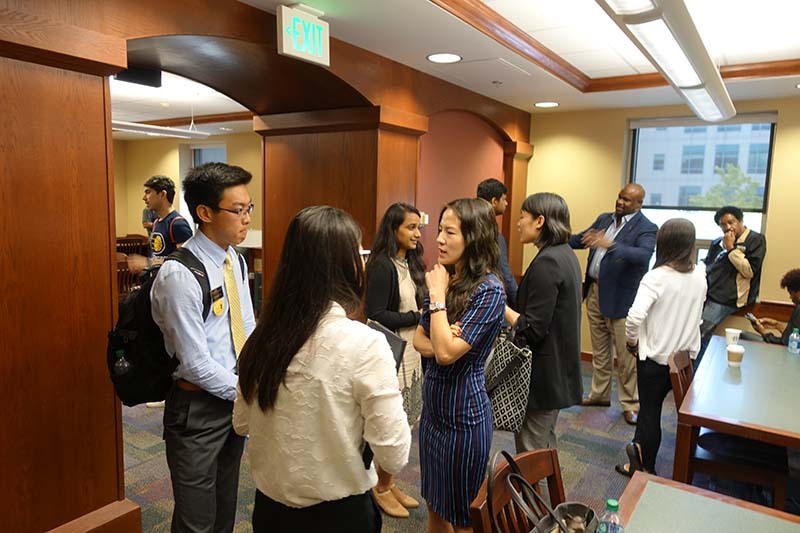 Members of the audience met with alumni, faculty, and student mentors. The reception was held in the Corporate Room in the Krannert Library. 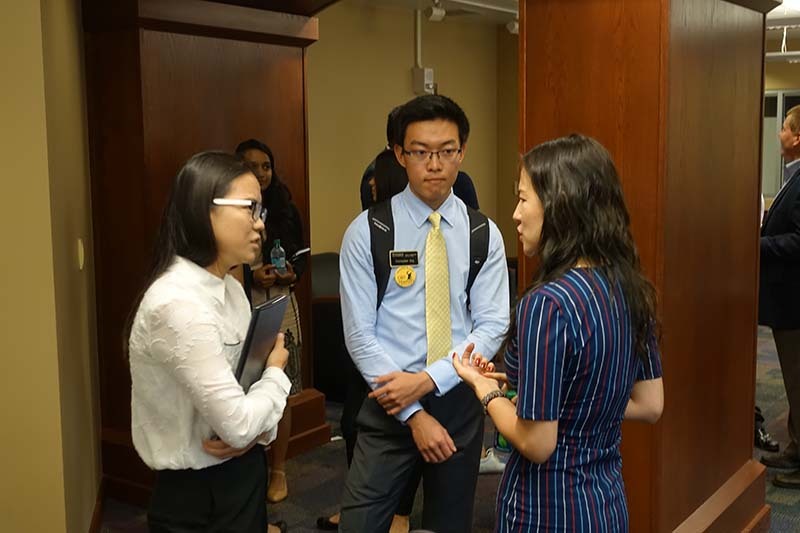 Hintz attended finance and accounting classes and shared many insights with Krannert undergraduate students in the week of Sept. 17, 2018. Hintz is an Adjunct Professor of Finance at New York University's Stern School of Business. He has been teaching at Stern since 2014. He served as the Equity Research Analyst covering the capital markets, exchanges and asset management industries at Sanford Bernstein & Co. from 2000 through 2014. For 13 years, he was nationally ranked by Institutional Investor Magazine and by Greenwich Research Associates. 10 years at Morgan Stanley Group as a Partner of that firm and its Treasurer. Hintz was Vice President and Treasurer of Anderson Clayton & Co. - a Fortune 200 consumer products company headquartered in Houston Texas. Various financial positions at Standard Oil of California. Master of Business Administration from the Wharton School. He serves on the Board of Leaders of the Marshall School of the University of Southern California. Hintz holds a commission as a Lieutenant Commander in the U.S. Naval Reserve. The company was highly leverage (total assets relative to equity) and was under review by the credit rating agencies. Hintz reduced the firm’s leverage, improved its funding base and turned around its credit outlook. As a leading fixed income broker dealer, the most powerful division at Lehman were the bond traders. Hintz’s new financial policies restricted their risk-taking activity – and thus their revenue. They soon “wanted his head”. In August 1998, the CEO’s secretary confided in Hints that the Fixed Income had demanded that he be fired. He then phoned his father who said “You now know what they will do before they do. Time to negotiate.” So he went to the CEO’s office and said he understood that he was going to be fired. The CEO asked who had told him this and that he had not yet decided. Hintz responded by saying that he would not tell who told him but if he resigned it would hurt the stock price. Lehman’s CEO negotiated a generous deal with him—a package more than what he had earned over the past 10 years. He signed the deal and the next day the company put out an announcement the he was retiring for medical reasons (purportedly a heart condition that he might not survive) and that the company wished his wife and himself the best in these trying times. Research teams are expected to know everything about and industry and the companies that are being covered. where it buys its inputs. Bernstein charges institutional clients to have access to its equity analysts. In Hintz’s case the firm charged $25,000 for an hour of Mr. Hintz’s time. The clients are portfolio managers within large mutual fund companies or pension funds. Though the financial crisis occurred 10 years ago, it still holds in the minds of the senior executives who lived through it so continues to affect their behavior. The severity of the crisis has led many executives today to realize that black swan events (i.e. unexpected events that can lead to systemic failure) are more common that they previously believed. Low interest rates made borrowing money cheap and home mortgages were readily available. Limits to new house constructions (particularly in the East and West Coast) limited growth of housing stock. This drove home prices went up and convinced large sectors of the population that real estate was a superb investment. Banks, which used to hold onto mortgages to maturity, found that they could profitably originate new mortgages and sell them to firms that securitized the mortgages into mortgage backed securities (MBS). To the originators, selling mortgages was highly profitable too. Selling mortgages meant that banks could earn fees and did not have to hold more capital against mortgages. But this new “originate to sell” business model broke the link between origination of the mortgage and the payoff of the loan. Individual mortgages cash flows were not predictable – a client can pay-off a mortgage any time that they wish. But bundles of mortgages can be sliced into many tranches that provide predictable cash flows. Predictable cash flows are worth more to the bond market than unpredictable ones. Moreover, the securitizing firms found that by mixing some weaker mortgages with high quality mortgages, they had a ‘recipe’ for manufacturing high yielding tranches that would still be highly rated by the credit agencies and could be sold profitably to investors around the world seeking low risk higher yielding assets. Ratings agencies were considered experts at examining the credit risk of financial instruments such as bonds and mortgages. They used historical loss statistics and stress tests of market downturns to determine rating for mortgage backed securitizations. Rating agency experts believed that homeowners did not default on mortgages. They believed that Americans would give up their credit cards and their cars before defaulting on their mortgages. As a result the rating agencies underestimated the credit impact of the weaker mortgages include in securitizations. The historical loss studies of the agencies justified AAA/Aaa ratings for mortgage backed securitizations and these high ratings made the MBS securities easy to sell to investors. Unfortunately, the rating agencies never analyzed a nationwide real estate downturn. Such an event had never occurred in the post WWII period. Financial deregulation had been pursued in Washington under the assumption that the capital markets would be more effective at punishing overly aggressive banks than regulators would ever be. New capital rules allowed Wall Street to increase its leverage. Lax enforcement of rules governing new underwritings led to a decline in the quality of Wall Street’s due diligence. Modern risk management at banks failed to predict the developing crisis. Elegant risk models that had been built and accepted at major banks around the world proved to be flawed. They were mathematically correct but the events of 2006-2007 were unlike anything they had been built to address. The assumption usually made in these early risk models was that risk distributions were normal Bell curves with thin tails. In fact. the tails are “fat” (Kurtosis is a measure of whether the data are heavy-tailed or light-tailed relative to a normal distribution). That is, data sets with high kurtosis tend to have heavy tails, or many outliers. A uniform distribution would be the extreme case.) This means that events are more likely to occur in the tails, making the predictions more unpredictable. For the banks, these risk management flaws meant that banks allowed their leverage to rise and their mortgage risk to increase – oblivious of the true level of risk that they were taking. When the poorer quality mortgages (sub-prime mortgages) began to underperform in late 2006, demand for new MBS securities fell. Investors began to sell MBS bonds which fell in value. Banks could no longer shed the pools of mortgages that they had bought to securitize. They were trapped with pools of mortgages on their balance sheet which were declining in value and generating mark to market losses. With no new investors to buy MBS securities, there was no way to originate new mortgages. The house price "bubble" burst without new mortgages. Homes could only be purchased for cash. Falling home prices resulted in homes worth less than the mortgage loan, leading homeowners to walk away from their property. Single-family residential mortgages delinquency rate beginning in August 2006 and peaking in the first quarter, 2010. The high delinquency rates led to a rapid devaluation of financial instruments (mortgage-backed securities including bundled loan portfolios, derivatives and credit default swaps). These could not be priced because their quality was uncertain. Securitization also made it impossible for homeowners to renegotiate their mortgages. The slicing and dicing of mortgages into small tranches made it impossible to pursue investors in order to arrange workouts for troubled homeowners. This exacerbated the number of personal bankruptcies and foreclosures which further weakened the economy and spread fear in the credit markets. As the value of these assets plummeted, confidence in the banks evaporated. Many of the largest mortgage securitization participants experienced a liquidity crisis – Lehman Brothers, Bear Sterns. Investors fled all risky assets and the fixed income markets around the world froze. With prices dropping and their (previously liquid) balance sheet frozen – the financial institutions failed one after another as their funding bases ran off and as creditors refused to lend to them. As banks failed lending dried up around the world and the global economy toppled over into the Great Recession. The largest capital market participants have lower leverage and stronger capital positions. Liquidity rules require banks to maintain large cushion of excess funding to carry them through any future funding run. New regulations have limited the risk that banks can take in their market making businesses. The financial crisis and new regulations made the major capital markets banks much less risk averse. There is a cost to this new safety. The bond market is inherently illiquid. In the vernacular of Wall Street “bonds trade by appointment.” That means that typically a Wall Street firm must actively make a market by buying bonds when a client wants to sell and selling a bond when a client wants to buy. This means that the bond market is liquid only if Wall Street provided the liquidity by taking risk and holding large inventories. Today, Wall Street is not taking much risk and the banks have shed much of their inventory to boost capital ratios. Many investors believe that this means that the bond market is much less liquid and that this illiquidity will eventually lead to wider credit spreads and higher borrowing rates which will constrain economic growth and potentially could have negative systemic effects. Wall Street is a demanding meritocracy populated by driven commercially oriented actors. It is fun but it is certainly not a 9:00 to 5:00 job – and few people ever get a gold watch at their retirement party on Wall Street. 100 hours a week and lots of take-out dinners. As a new employee it is hard to have time to keep a houseplant alive, never mind a personal relationship. Therefore, turnover is high – about 15 to 20% per year. The companies practice a ‘grow or go’ policy of terminating employees that are no longer eligible for promotion. It takes 9 – 13 years for a new MBA hire to become a partner. Do not waste time going through Human Resources. Write to people who are doing the work. Be prepared for a lot of rejection. But with 15-20% turnover Wall Street is always hiring. Interested in investment banking, private equity, portfolio management, business and corporate development, capital markets, equity and credit research, and industry corporate finance careers? 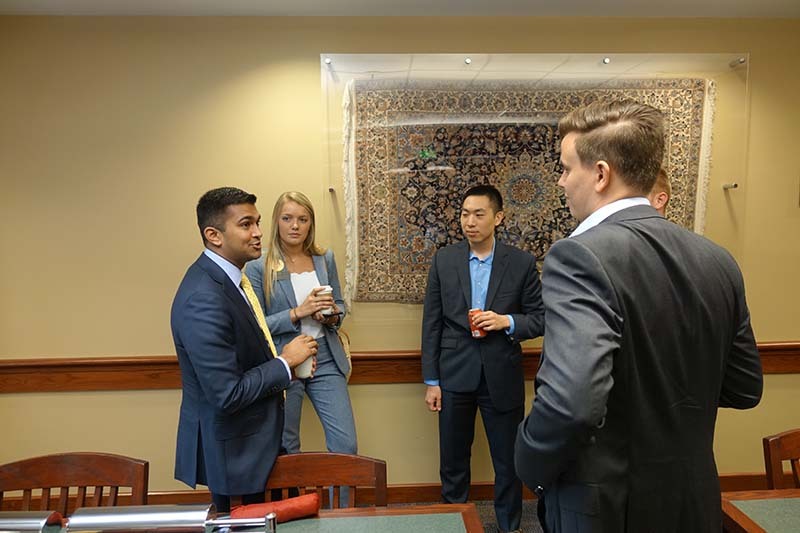 The Purdue Finance Workshop and Larsen Leaders Academy will be hosting Wall Street Prep’s Financial & Valuation Modeling seminar at Purdue University April 8th & 9th. This intensive 2-day weekend seminar is led by former investment bankers with applied expertise in financial and valuation modeling methodologies, and bridges the gap between academics and the real world to equip students with the hands-on practical financial skills that they will need to excel during the recruiting process and on the job. Three days of training to kick-off the year’s programming effort; led by alumni and Training the Street. The focus is on ramping-up students’ knowledge, fine tuning their resumes and preparing them for interviews. Beginning in early fall, 40 students (sophomores and juniors) will be selected to be official workshop participants, there will be an open application period and the top 40 students will be chosen to participate. Conference brings relevant speakers to campus to discuss different career paths, current industry trends and provide mini-case studies that are relevant to on the job situations.